On March 16, days after President Trump boasted about his support among police, military members and motorcycle bikers and how they could get “tough” with his opponents, Stephen Colbert sounded wistful on The Late Show. “At times like these, I think about the President we could have had, Hillary Clinton. Not perfect, obviously. But you know, not publicly threatening The Purge,” Colbert quipped. The CBS late-night host’s political candor has been credited with the Late Show‘s ratings rise since Trump’s 2016 election. And, in the 18-49 demo this month, Colbert recently topped NBC’s Tonight Show host Jimmy Fallon for the first time since the host’s Late Show launch in 2015. The former Comedy Central host is also viewed by many Americans as one of the most liberal late-night shows on television today, a new Hollywood Reporter/Morning Consult poll finds. (The survey was conducted among a nationally representative sample of 2,201 adults from March 7 to 10 this year.) Some 42 percent of respondents describe Stephen Colbert and ABC’s Jimmy Kimmel as “more liberal” politically, while 40 percent think the same of Jimmy Fallon. About 43 percent of respondents surveyed in this poll stated that they watched late-night shows live on television “multiple times a week,” with 31 percent saying they checked Facebook or YouTube multiple times weekly to catch up on clips from these hosts. Americans seem to have the most favorable impression of Jimmy Fallon among late-night personalities, with 58 percent of respondents saying they generally like the host. 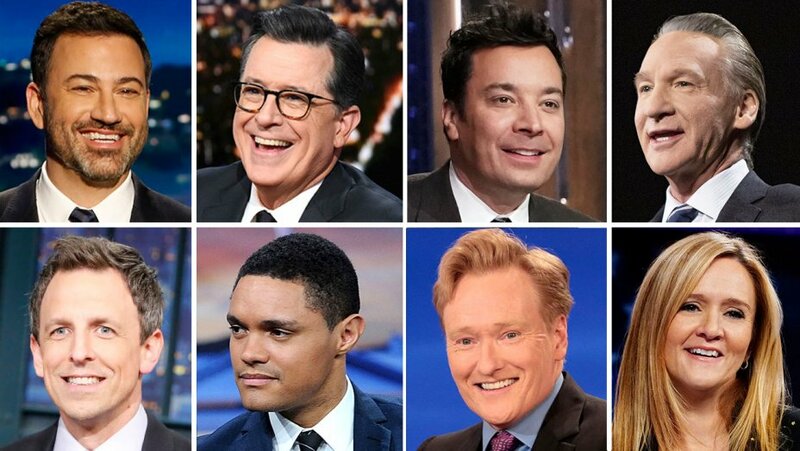 The Tonight Show host is followed by ABC’s Jimmy Kimmel (56 percent favorable), TBS’ Conan O’Brien (48 percent), CBS’ Stephen Colbert (44 percent) and NBC’s Seth Meyers (40 percent). Meanwhile, 33 percent of respondents viewed HBO’s Bill Maher favorably, with Comedy Central’s Trevor Noah (30 percent), HBO’s John Oliver (28 percent) and TBS’ Samantha Bee (21 percent) trailing by that measure. The survey also looked at which late-night hosts Americans wanted to hear more from when it came to political opinions. By this measure, Colbert also led the way: Some 30 percent of respondents replied that they liked when the CBS host discussed politics, while 29 percent enjoyed Kimmel and Fallon’s political segments and 24 percent liked HBO host Bill Maher’s Beltway takes. This season, CBS’ Late Show With Stephen Colbert is averaging 3.8 million total viewers while NBC’s Tonight Show clocks in at 2.48 million and ABC’s Jimmy Kimmel Live! follows at 2.07 million.